Klyde Warren Park announced today the full lineup for Park & Palate’s Grand Tasting presented by Central Market, including wineries, East Lawn programming, cooking demonstrations, and more. The second day of Klyde Warren Park’s inaugural fundraiser supporting the Woodall Rodgers Park Foundation, the 501(c)(3) that operates Klyde Warren Park, takes places on Saturday, September 26 from 12:00 to 5:00 p.m. The Grand Tasting presented by Central Market will highlight Texas’ most popular and celebrated chefs in addition to showcasing incredible wineries and spirits, including Duckhorn Vineyards, Perrier Jouët Champagne, Whispering Angel, Hall & Walt Wines, Duchman Winery, Absolut Elyx, Jameson Black Barrel, and more. Matt Orth of Lark on the Park and Michael Martensen of Proof & Pantry will create cocktails during both Down to the Roots and the Grand Tasting. Chef Jason Dady of Jason Dady Restaurant Group from 12:15 to 1:00 p.m. Chef Tiffany Derry of Tiffany Derry Concepts from 1:15 to 2:00 p.m. Chef Kent Rathbun of Abacus and Jasper’s from 2:15 to 3:00 p.m. Chef Jonathan Waxman from 3:15 to 4:00 p.m. Chef Amanda Freitag from 4:15 to 5:00 p.m.
Tai Chi with El Centro College from 8:00 to 9:00 a.m.
Heartfulness Meditation from 8:00 to 10:00 a.m. SWEAT in the Park Boot Camp from 9:00 to 10:00 a.m.
Yoga with Dallas Yoga Center or Family Yoga with Crow Collection of Asian Art from 10:00 to 11:00 a.m. Build Your City! With Dallas Center for Architecture from 10:00 a.m. to 4:00 p.m.
Balance and Harmony Dog Training with DogFit Dallas from 10:30 to 11:30 a.m. 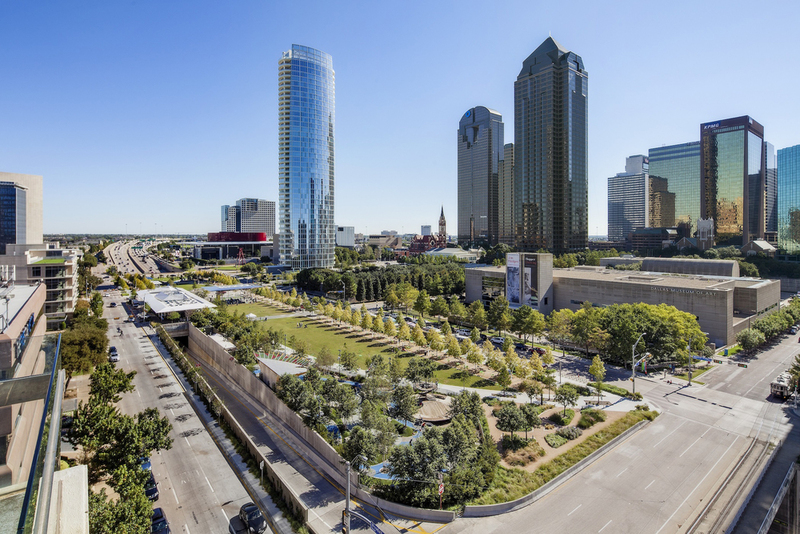 Outdoor Learning Lab featuring highlights from the Klyde Warren Park Curriculum from 11:30 am to 1:30 p.m.
Secret Life of Pigeons with Trinity River Audubon Center from 1:00 to 2:00 p.m.
Dallas Skyline 360 Tour with Dallas Center for Architecture from 2:30 to 3:00 p.m. Instrument Petting Zoo with School of Rock from 3:00 to 4:00 p.m. The John Wayne Film Festival featuring The Searchers from 7:30 to 10:00 p.m. In addition to participating as a judge in Down to the Roots on Friday night, Food Network star and cookbook author Chef Amanda Freitag will also host the very first signing of her book scheduled to be released later this month, The Chef Next Door: A Pro Chef’s Recipes for Fun, Fearless Home Cooking. Freitag, one of New York’s most celebrated chefs, is a judge of Food Network’s Chopped as well as the co-host, alongside Ty Pennington, of American Diner Revival. Freitag’s book will be available for purchase and to be signed throughout the Grand Tasting. Scott Murray, a multi-Emmy-Award-winning broadcast journalist and TV/radio host, will take the role of emcee for Saturday’s Grand Tasting presented by Central Market in addition to Friday night’s Down to the Roots event. Murray has more than 35 years of experience in media, in addition to emceeing live events and galas in the Dallas-Fort Worth area. DJ Lucy Wrubel, a world-traveled DJ based in Dallas and named “One of the Top Ten DJs in Dallas” by D Magazine, will round out the featured talent on Saturday during the Grand Tasting presented by Central Market. DJ Lucy Wrubel, known as a voracious collector of eclectic tunes, has played a wide variety of exciting events ranging from North Park’s Fashion at the Park in runway tents to Neiman Marcus’ 100-year bash. Chefs participating in the Grand Tasting include Anastacia Quiñones of Kitchen LTO; Andrea Meyer of Bisous Bisous Pâtisserie; Andrea Shackelford of Harvest; Andrew Wiseheart of Contigo and Gardner; Becky Masson of Fluff Bake Bar; Braden and Yasmin Wages of Malai Kitchen; Brian Johnson of Central Market; Brian Luscher of Luscher’s Red Hots; Danyele McPherson of Remedy; Dennis Kelley and Melody Bishop of Lark on the Park; Diego Galicia and Rico Torres of Mixtli Progressive Mexican Culinaria; Graham Dodds of Hibiscus; Jason Dady of Jason Dady Restaurant Group; Jeramie Robison of Shinsei; Jodi Elliott of Bribery Bakery; Joel Harrington of Bolsa; John Coleman and Joe Scigliano of Savor Gastropub; Julio Peraza of Proof & Pantry and Madrina; Matt Orth of Lark on the Park; Meaders Ozarow (owner) of Empire Baking Company; Michael Martensen of Proof & Pantry and Madrina; Misti Norris of Small Brewpub; Omar Flores of Casa Rubia; Paula Lambert of Mozzarrella Company; renowned pastry chef Philip Speer; Rich Rogers of Scardello Artisan Cheese; Richard Blankenship of CBD Provisions; Sarah Snow of The Grape; and more. Tickets for Park & Palate’s Grand Tasting Presented by Central Market are on sale at www.ParkAndPalate.org starting at $150, with all proceeds generating funds for Klyde Warren Park and its free daily programming. Park & Palate will offer a limited number of tickets for an exclusive VIP experience, which includes a VIP lounge in Savor Gastropub with food by Chef Jonathan Waxman and Chefs Stephen Rogers and Allison Yoder of Gemma, wine seminars, mixology demonstrations, and prime viewing of the main stage. Park & Palate will take place at Klyde Warren Park, located at 2012 Woodall Rodgers Freeway in Dallas, Texas.For more information on Klyde Warren Park, please visit www.KlydeWarrenPark.org.